Keep rain gutters clean and unclogged to prevent damage to your home’s roof and exterior. 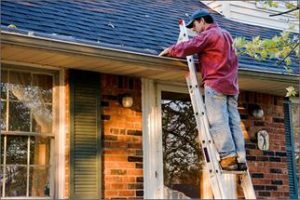 There are just a few steps to follow in order to maintain gutters. First, climb a ladder and clean the goop out of the gutters. The decomposed leaves make great mulch or compost. Pay particular attention to the downspout. If leaves and debris are clogging it, water won’t drain properly, and along with mildew and mud you’ll end up with sagging gutters. Check all the spikes that are supposed to go through the gutter, through the fascia board and into the rafter behind it. At most homes, these spikes miss the rafters entirely, usually because the spike has just worked its way out of the hole over the years. It’s a good idea to invest in new gutter spikes so the gutters are securely fastened once again. During this inspection, check out the rivets on the downspout. Frequently they’ll be loose or will have dropped out completely, all that is needed is a rivet gun to secure them anew. Buyer’s guide: Purchase new rivets at the hardware store. You can also buy a rivet gun there, usually for about $20. Once you’ve finished with the mechanics, you can attend to cleaning the gutters. The best way is with a pressure washer, which you can rent or even purchase for anywhere from $60 to hundreds of dollars. Follow the instructions that come with the washer to the letter; usually the washer can be used with garden-hose water or some type of cleaner. A pressure washer won’t hurt the gutters provided you’ve secured the gutters with screws or new spikes. The real key is to avoid hitting the gutters at too high an angle or you’ll blow the shingles off with a high-pressure stream of water. If the gutters are rusting, they are very old. They’ve moved to aluminum and vinyl gutters now, and they don’t rust. You might want to consider new gutters. But if you’re going to stay with the old ones, get all the rust off, sand them down, paint them with a good primer and then with a good-quality rust-inhibiting paint. A splash block is a very important element. It keeps the water coming out of the downspouts from digging a trench next to the house, and it keeps water away from the home’s foundation.